My Fling with an Island. 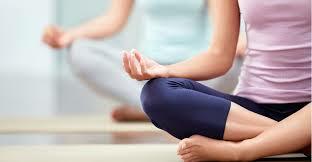 My yoga practice began in earnest while I was living on the wonderful island of Mallorca. A place that is very dear to my heart. Here’s something I wrote about my fling with an island. So, the seed was planted, and a year later I found myself packed and at the airport with a one year old and a six-year-old. We were headed for our three-month Mediterranean adventure. My husband came with us to ‘settle us in’ and then we were on our own, and he would start the commute between Palma and Belfast. Ignorance is bliss; I look back and smile at my naive audacity as I rocket-launched us into a new life. The night before my eldest sons’ first day at school; it began to sink in. I hardly slept. He’d been very happy in his school at home and had made good friends; were we being unfair to take him away from all that? To take him away from his grandparents and wider family circle who adored him? How would he cope with the language? His school day at home finished at 1.45pm, but there it didn’t end until 4pm! Surely he would be exhausted, it would all be too much, he would weep every night for his father and for the familiarity of home, how could I alone be enough for him? What ever made me think I could do this? The next morning, my anxieties were swept aside when the headmistress cheerily took my boy to his class and he happily waved us goodbye. By the end of that first day I expected tears, I expected a forlorn face, I expected, “I want to go home” but instead we got a smiling, beaming happy face excitedly asking if his new friend could come fishing that night. He dumped his schoolbag and ran past us to play with the other children. The school was small and compact with a playground and a games pitch in the centre of the myriad of buildings that made up its entirety. In time, we would get used to the joyful chaos each morning and afternoon as kids ran in every direction, footballs were kicked and teachers stood chatting outside classrooms. This was Mallorca where the sun shines most days of the year, there is no need to rush inside because of the cold or the rain. Assemblies were held outside, children of whatever age, or class, were allowed to play wherever they wished. There was a relaxed freedom, a shift in atmosphere, it was a breath of fresh air away from the stifling ‘health and safety’ rules and regulations that dominate every aspect of the UK; it was exactly what we had been looking for. 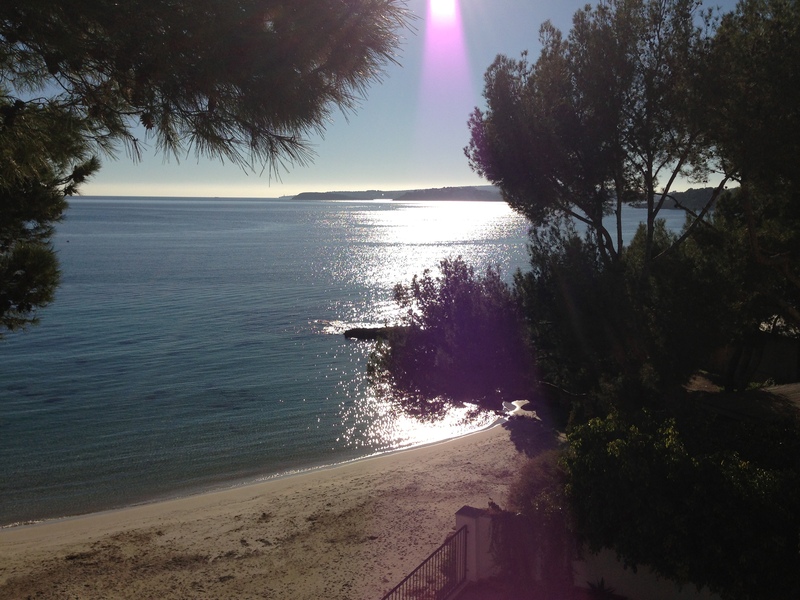 We would discover that Mallorca is a fabulous melting pot of nationalities and stories and lives. It was a world away from Northern Ireland. In time, our eldest came home from school speaking Spanish, not just Norn-Irish Spanish like me, but actual beautiful native-sounding Spanish. It was a joy to see both my sun-kissed blonde boys bloom in the Spanish sun. Three months? We weren’t going back after three months; we were staying. So our three-month adventure was extended to another year; we had to let our boys taste a little more of this for as long as we could – didn’t we? When you stand and look at something from a distance and you’ve got the will to do it, you don’t see any of the problems, or if you do, you gloss over them. Living in a foreign country alone with two small children is not easy. You’ve got no back up, you’re IT, 24×7. But we had sun, so much sun, even in winter, we had the beach and William had good friends, I had made good friends, our Spanish was getting better, our two-year old was fluent, we were doing something different, unique, we were living the Mediterranean dream on a beautiful island, juicing oranges for our breakfast every morning; what’s not to love? 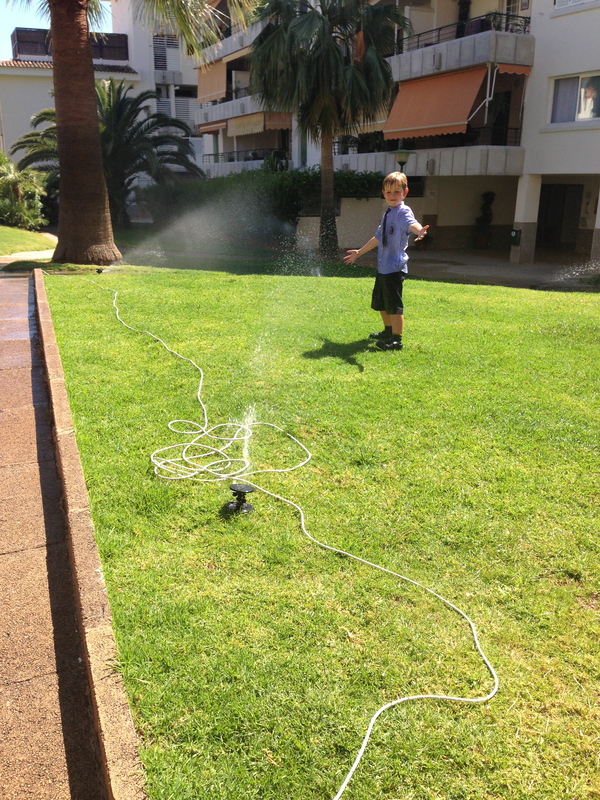 Cooling off with garden sprinklers after school. The problem was our ‘fling’ with the island was getting serious; it was only ever supposed to be a short-term, no strings attached affair, but it was turning into something more; we were getting attached. We’d swim in the crystal blue Mediterranean sea, we ate healthier, we’d cycle through the island’s breath-taking innards to discover villages that time seemed to have forgotten, we made friends from around the globe our lives there were full of colour, full of flavour and full of sunshine. Surely we had to do another year. Just one more year and then we would come home; after all one year goes so fast, and if we didn’t do it then we’d miss our window, we’d never get the chance again… so we signed on, reserved school places, made the decision, everyone celebrated. We were staying! But the Mediterranean dream was only part of the picture, the rest of the time my husband was at home in the cold and rain, working even harder, so that he could take the time off to come over for his next scheduled visit. I struggled to manage a boisterous two-year old and a seven-year old single-handed. It became exhausting, especially for my husband, who was doing all the commuting. I missed him, we missed each other, we were a family of four (five if you count the dog) not three, and no amount of Mediterranean sunshine could make up for that. Something had to give. So it was with heavy hearts that after eighteen months we called it a day on our adventure and came home for good. It was never intended, but like many affairs, the end was sudden and unexpected; demanded by invisible forces, and leaving broken hearts on both sides. Would I do it again? In a heartbeat. Would I do it differently? Probably. Am I glad we did it? Absolutely. We will always have very special memories and special friends* from our time there. I hope we have opened our sons’ horizons to what is possible beyond the shores of Northern Ireland, and allowed them to experience the world as one big playground and given them their first tool; a second language, with which to enjoy it. I hope it has marked their hearts in some invisible, yet permanent way forever. It has mine. Don’t forget to stop and pick the blackberries. Now that school has started back the days seem to fly by before I can grasp each one and look it in the eye. No matter how early I rise a single day never seems to hold enough hours for me. We have just begun a renovation project: it’s our dream house, our house for life, it seems unreal that it will actually be ours. It is another huge commitment that is not writing! Instead of spending precious child-free hours at my laptop I’m as likely to to be found looking at wooden floors or bathrooms. In the past few weeks this has left me feeling stressed. 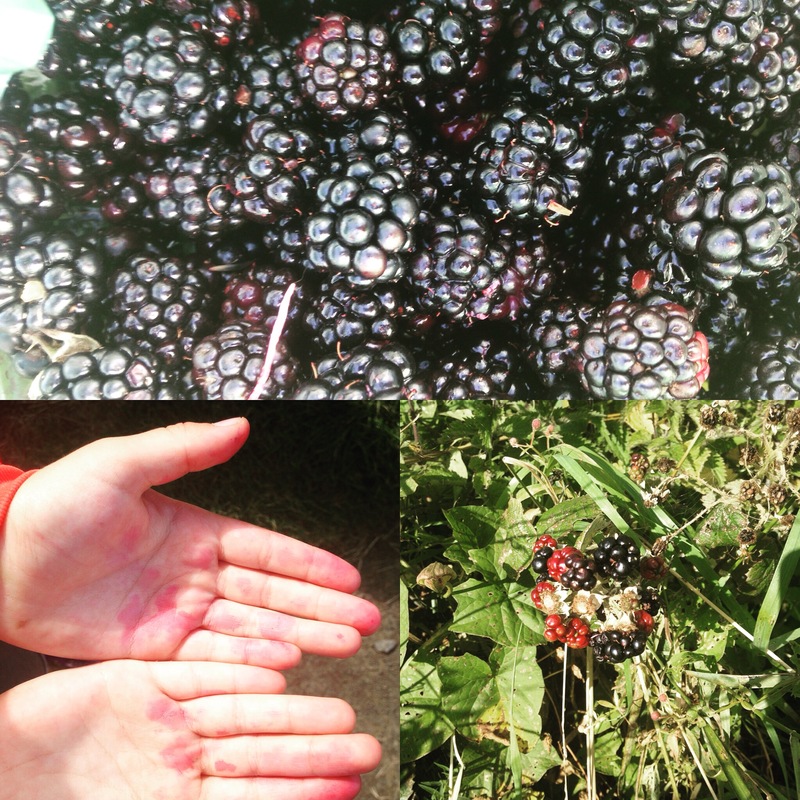 On Sunday afternoon my boy and I went blackberry picking. In a matter of weeks he will be nine. He finds me embarrassing, mostly. He is growing up and pulling away from me. And then, on Sunday all he wanted to do was to walk the LONG way home, pick blackberries in the sunshine and hold my hand. It’s enough to bring a lump to my throat, even now. We spent nearly three hours wandering and picking and eating the best ones. I read Seamus Heaney to him which pretty much fell on deaf ears, but it put me in some kind of heaven. The afternoon reminded me of the importance of enjoying the moment, enjoying the day doing nothing, but doing everything. Most days I am consumed by my focus to write, to etch out a quite time and space for myself in the day when I can chip away at my goal to get my second book finished and hopefully published. Sunday reminded me of my priorities. Yes, getting published is my own personal utopia, but amongst the bigger picture of my family it is very much my own personal dream. It can never be at the cost of my boys, because like most mothers: it is to them that my life belongs. And what use are words without a life behind them to give them meaning. This morning I went to the wonderful ‘Little Pink Kitchen’ for brunch. Not only was the food fabulous, but I met the most wonderful and inspiring assortment of women; from a young professional athlete taking a year out to try and ‘make’ it, to a Belfast Telegraph ‘Woman Of The Year’, to budding entrepreneurs determined to show the best of what Belfast and N.I has to offer. There was an incredible energy in the room as strangers became friends over fab food, while Sarah and Keith tended to our every whim providing cheerful and generous hospitality.